NH Archery 2014: Hunts 1,2,3, & 4 - Lots of Food! - the4pointer.com | Real Hunts. Unreal Stories. 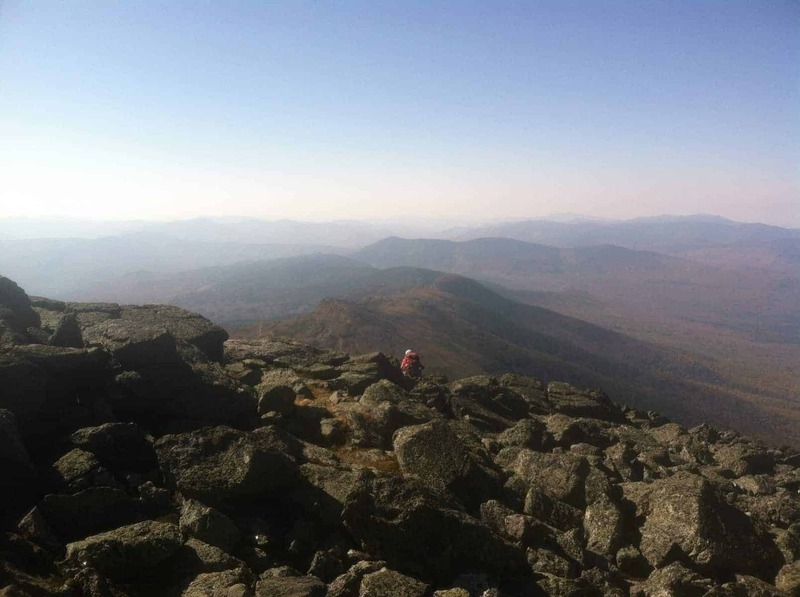 NH Archery 2014: Hunts 1,2,3, & 4 – Lots of Food! Well, let’s just say it’s been a slow start to the season. 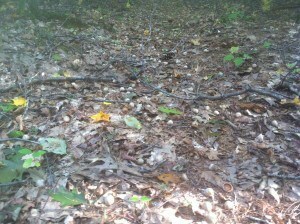 The busyness of the summer had left me with no time to scout so when the archery season opened on the 15th I headed to the woods with only the history of previous years to use in determining where to sit. When I arrived at the property I noticed a heavy crop of apples. Normally this is a good thing –but after a few hunts I am not so sure. Here is a recap of my first four hunts and what I have learned so far. 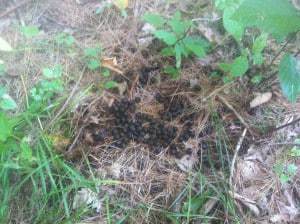 Hunt 1: September 15th – When opening day arrived I wasn’t even sure I’d be able to hunt. On Monday’s my wife has to work late so that means I am on childcare duty but a last minute offer by my mother to watch Sam allowed me to head to the woods. With no scouting under my belt my gut was telling me to head to a permanent stand that has produced many deer in the past. However, my sore toe told me to head to another permanent stand a little closer to the truck so that’s what I did. I ended up seeing three deer that evening. One was a spike still in velvet and I couldn’t tell what the other two were. The evening ended without any of them wandering close enough for a shot and I headed home wondering what I’d find when I eventually made it further into the woods. Hunt 2: September 17th – On this evening my toe and my gut told me to head back to the same stand. 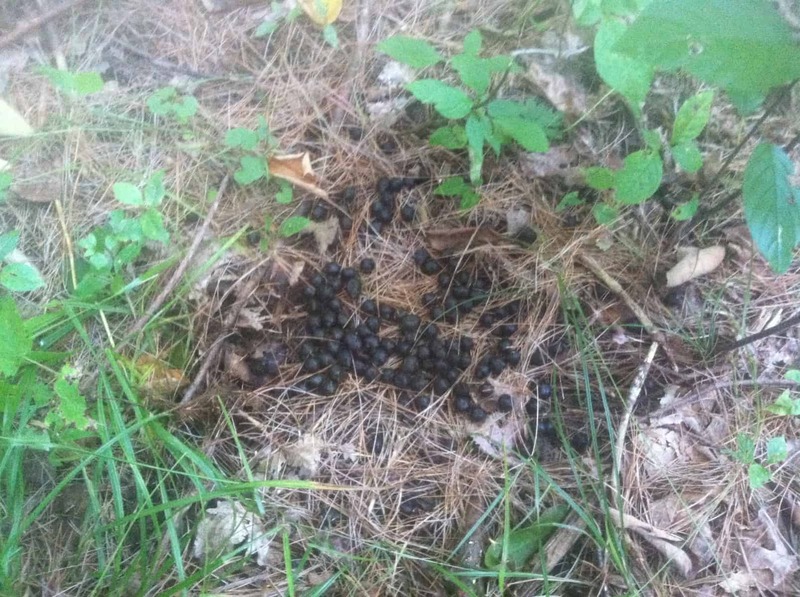 After all, I had seen three deer from it the evening before and there were droppings all around it. Surely something would come in. But as darkness fell and with no deer sightings for the evening I left still wondering what was deeper in the woods. I had arrived a little earlier than the last hunt which gave me some time to scout around a bit, although still not very far from the truck. I discovered an oak loaded with acorns which made me even more curious. Acorns are a double edged sword in my opinion. 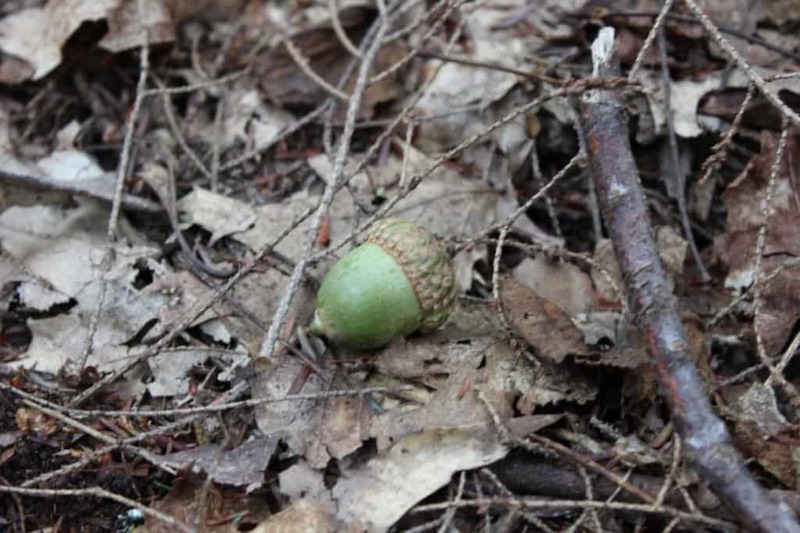 One oak tree producing acorns is great but every oak producing acorns can be challenging when trying to pattern deer. Hunt 3: September 24 – On my third hunt of the year I finally had enough time to hunt a little further from the truck and do a little scouting along the way. Sure enough, every oak tree I came across had massive amounts of acorns. Eventually I decided to set up my climber in the middle of 4 mature oaks and hoped for the best. Although there was not a defined trail past my stand set up, historically it is an area that deer often use when travelling to and from a bedding area. The only problem right now is that the entire woods is essentially a food source so it’s a guessing game as to where the deer will show up on any given night. On hunt number 3 I guessed wrong – no deer again. 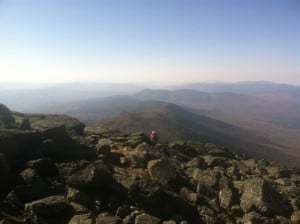 Hunt 4: September 28 – I started off my morning in the White Mountains atop Mt. Washington and ended up sitting in my climber overlooking a hardwood ridge in the evening. Josh and I were finally able to hunt together and he suggested we sit near where I had the run in with The Snorter last year. He’d been out scouting a bit earlier in the afternoon and discovered that area was also covered in nuts so it seemed like a good spot to try out. We reconvened at dark and he informed me he had a doe about 100 yards down the ridge snorting and blowing over and over. That’s funny because she was right where I’d had my run in with her. Maybe it was the same deer! At any rate, my fourth hunt ended with no sighting of deer. Having spent no time in the woods prior to opening day (not even to set up trail cameras!) I have been learning on the go. Here are three things I’ve learned that will help you as you hit the woods for the first time this weekend if you are a bowhunter in Vermont or are struggling to find the deer like me with the season already open. Every fruit bearing tree has fruit this year! Apple trees, Oaks, Beech and Hickory are all producing heavy, in some cases extremely heavy, crops this year. 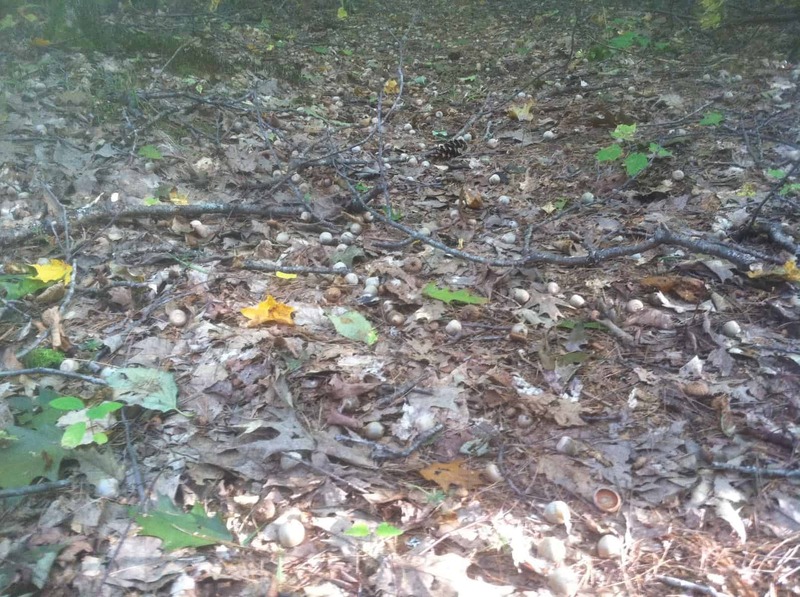 This can make deer extremely hard to pattern since they have no reason to return to the same area to feed every night. Look for signs that indicate current feeding – i.e. partially chewed nuts, shells, etc. When you find them hunt over them. I’ve read that deer will return to a spot for 2 -3 days to feed before moving on to another area so be sure to hunt the hot spots when you find them. If you don’t see any activity, move on. Be mobile! – I often make the mistake of going to the same spot too many times without seeing deer because it has produced in the past. This time of year when there is little hunting pressure I’ll need to be a little more mobile. Returning to the same spot twice without seeing deer is a good indication that they just aren’t there (yet). With so much food available, try moving around until you find some activity instead of waiting until they eventually return to last year’s hot spot. It’s Early, be Patient. – It’s still September and in some states the season hasn’t even opened so there is no reason to fret. In NH I have until December 15th to fill my tags, yet I still have to remind myself that there is no rush to fill a tag just because I am seeing pictures of other hunters with their deer. Being at a slight disadvantage for having no time to scout AND with so much food in the woods I’ll need to be patient – plain and simple. If you are like me you’ll probably need to do the same.